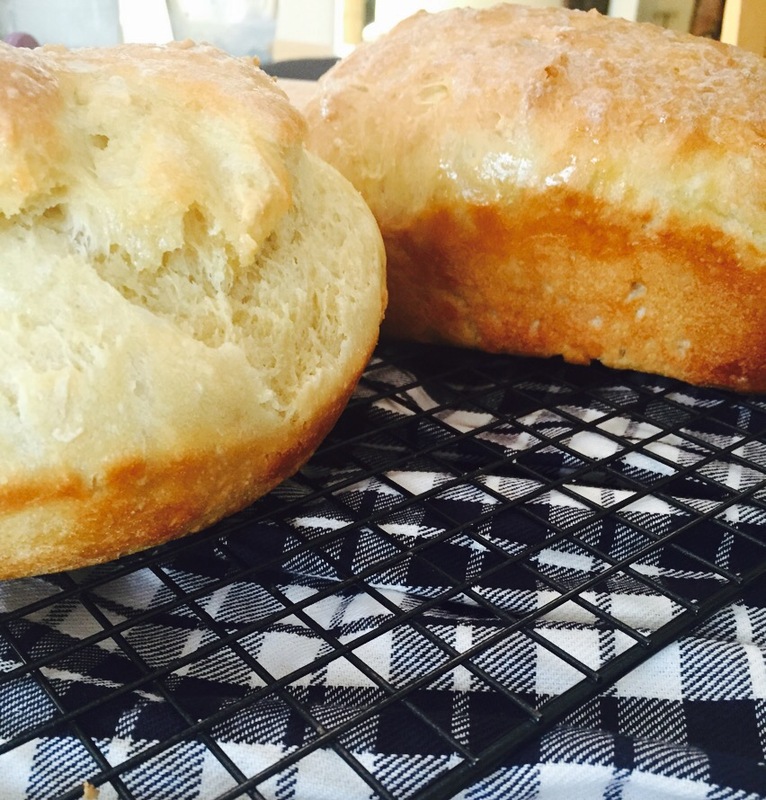 I’ve grown pretty acustom to making breads once or twice a week here at the homestead. Especially during the winter when the pigs are in the freezer and not in the pen waiting for old bananas and eggs. I truly believe in that old saying, waste not want not. Typically, I buy a big bunch of bananas on a Sunday expecting I’ll have a few brown ones by Wednesday. My daughters can be pretty picky over browning fruit. They’ve never complained about my banana bread though! My husband begs me each week to make it. 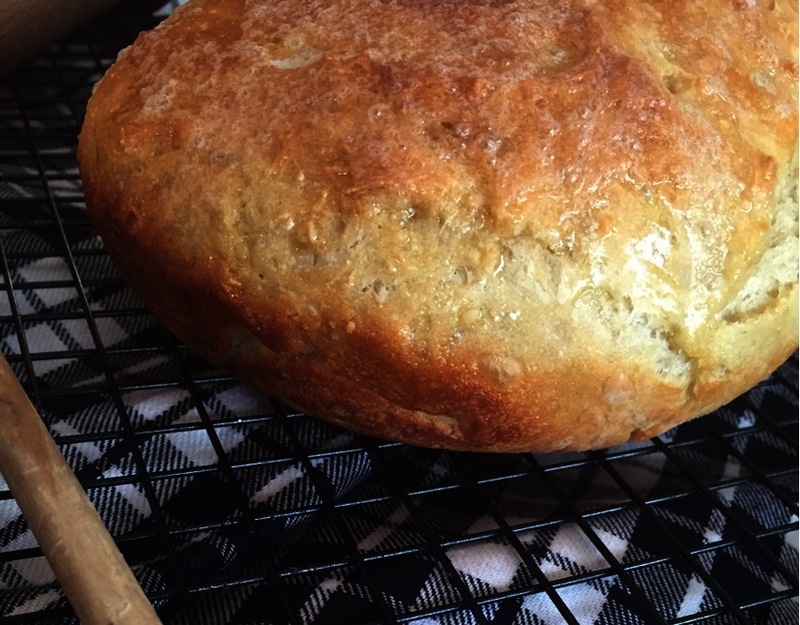 Making other breads like focaccia or potato bread is my favorite way to use up eggs or potatoes on the verge of eyes. 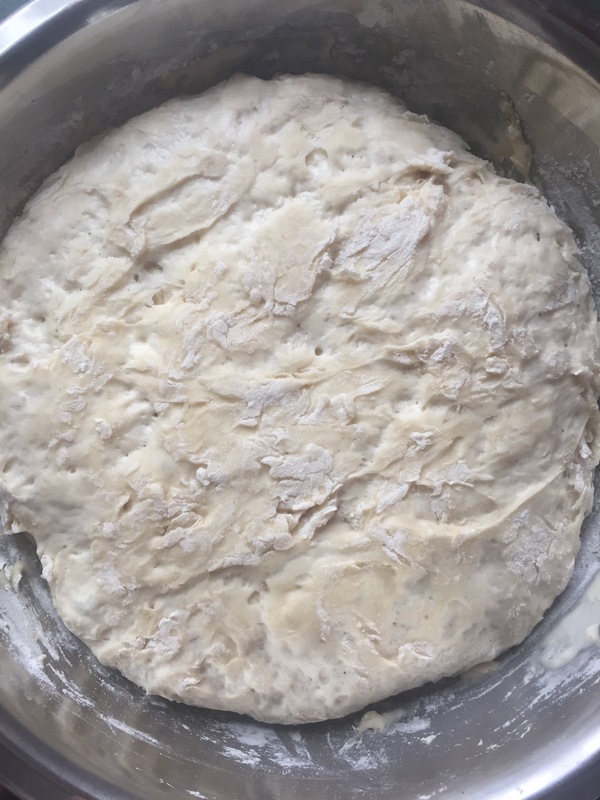 This recipe for No Knead Bread, only requires 5 simple ingredients and tastes like you just went to the bakery! 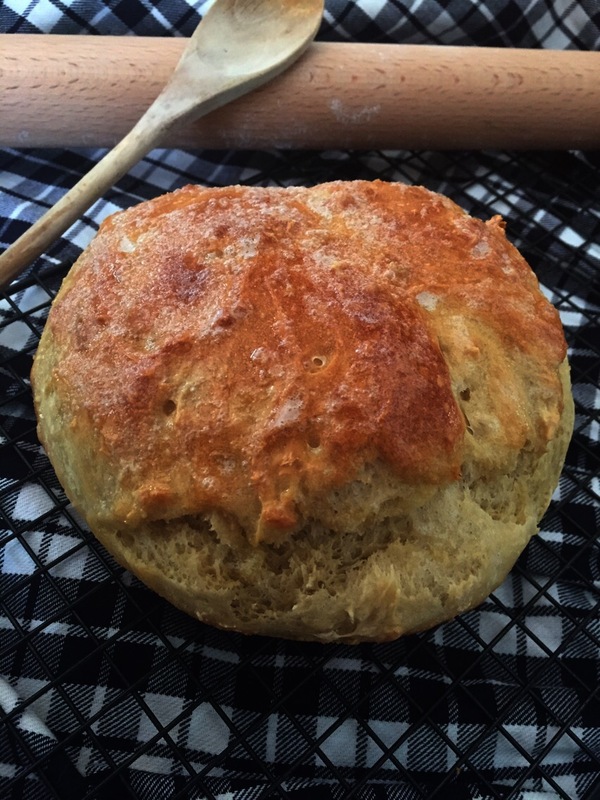 Get into the habit of making this super simple bread each week. Your family will love you for it! Start with 2 cups of hot water…not boiling or simmering water, but hot water. To it, add 1 heaping tbsp of pure granulated sugar. Stir it a bit to dissolve. Next sprinkle a .25 oz packet of fast rise yeast over the water and sugar. 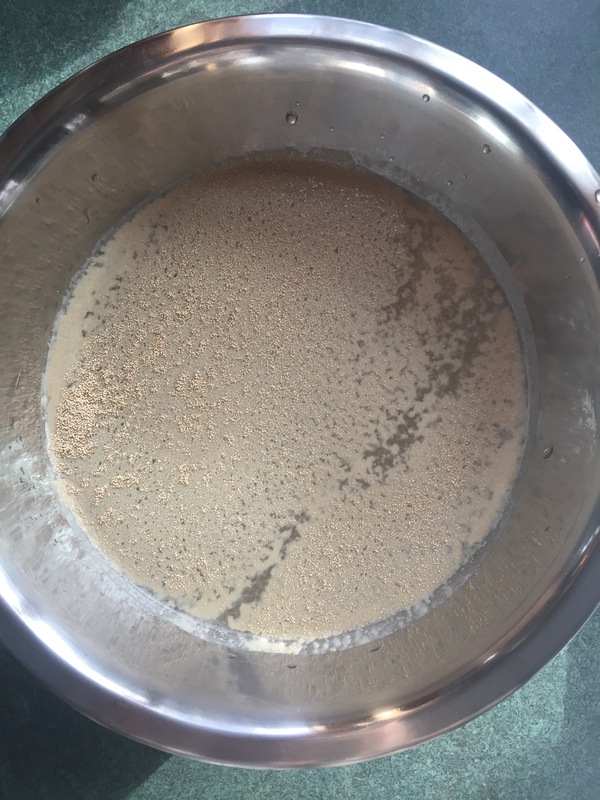 let it sit for 10-15 minutes until the yeast turns all foamy and magic like. 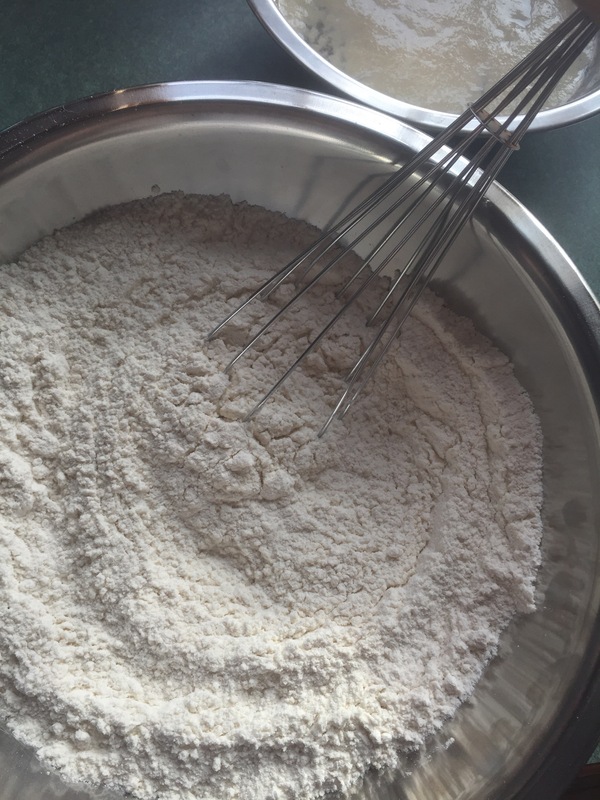 While your waiting, whisk together 4 cups of white, all purpose flour and 2 tsp’s of kosher salt. 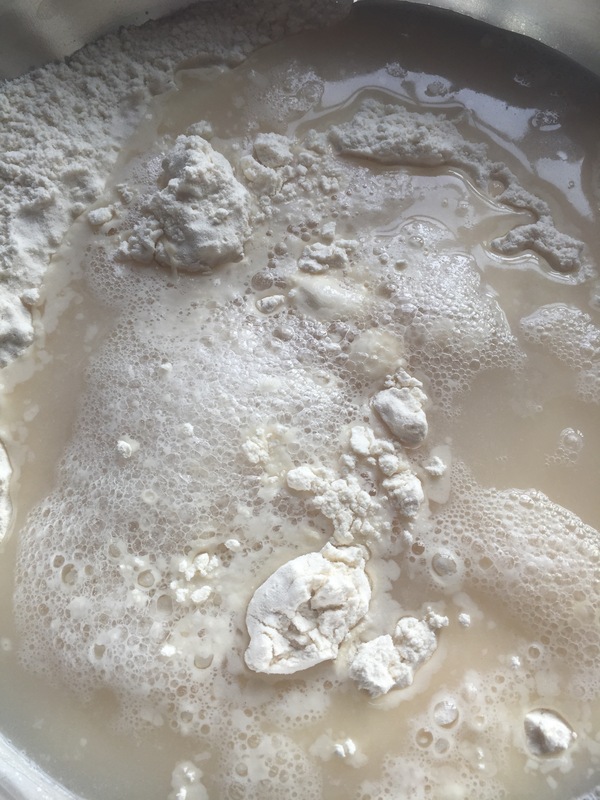 Once the water and yeast looks foamy, pour it over the flour in a large bowl. 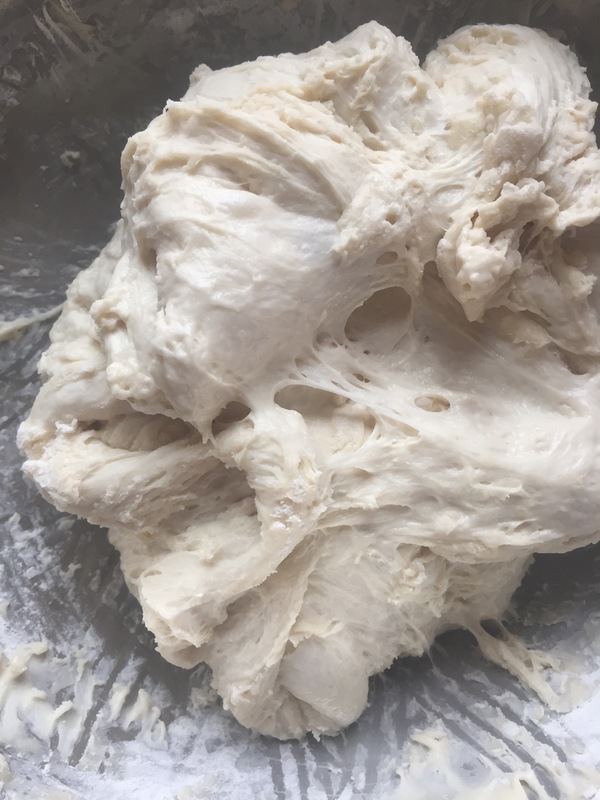 Mix it all together gently with a fork or a spoon till the dough has formed. This will only take a minute. 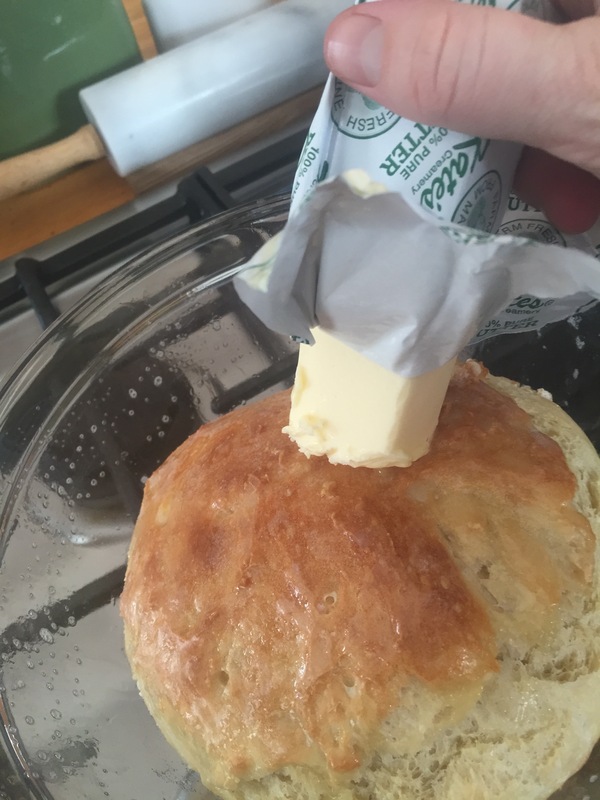 Cover the dough with a tea towel and set your timer for an hour and 30 minutes. 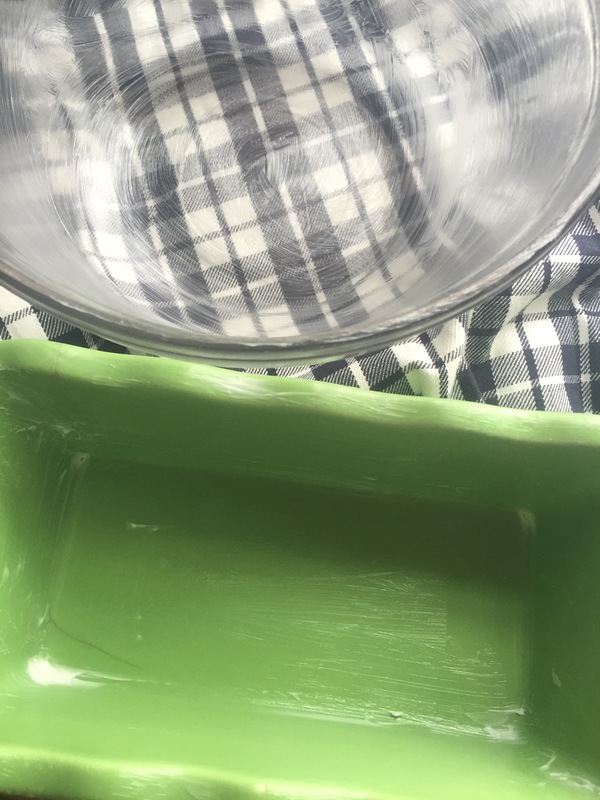 Place the bowl in a warm place to rise. I put mine right next to the wood stove. Not too close! No accidents should occur during the making of this bread. 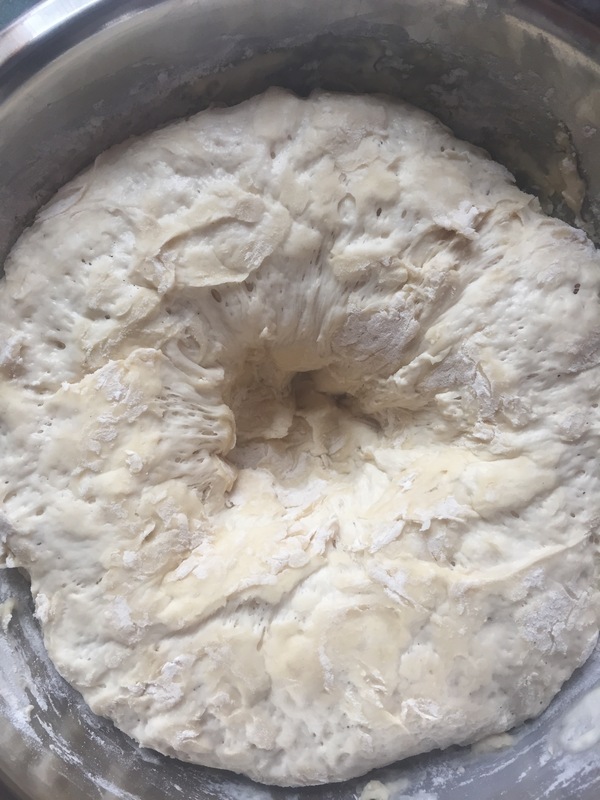 After an hour and a half the dough should have risen. Punch it down once right in the center. 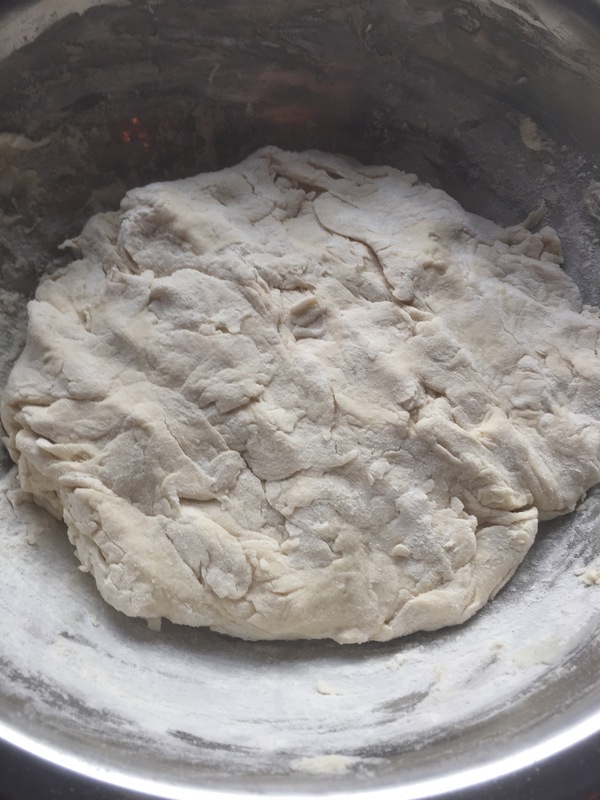 Then using a fork, scrape down the sides of the bowl folding the dough into the middle of itself. 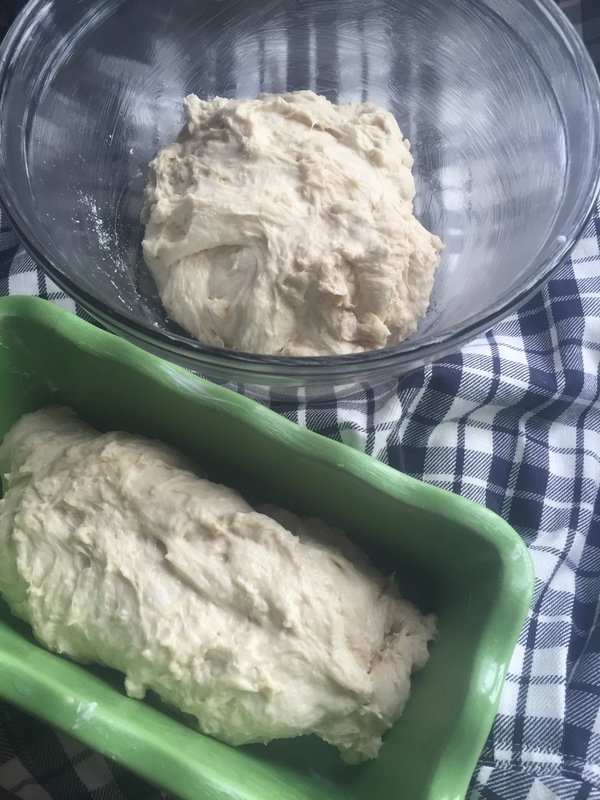 Separate the the dough right down the middle and place into 2 well greased baking pans or loaf pans. Cover them again with your tea towels and return them to that warm, happy place and let it rise again for 30 minutes. Set your oven to 425. 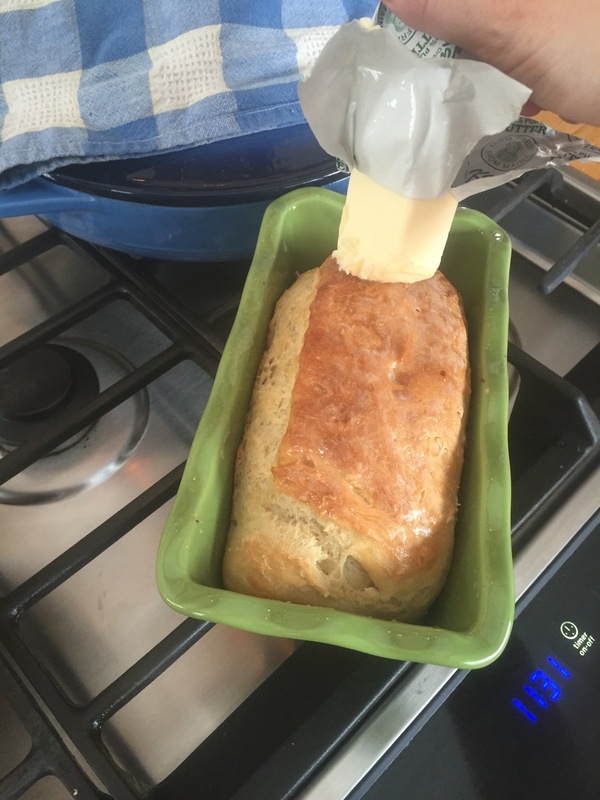 After 30 minutes, place your loaf pans in the oven and bake for 15 minutes. After 15 minutes reduce the oven temperature to 375 and bake for an additional 15 minutes. I reccomend getting out the butter! Slip the bread onto a cooling rack for 10 minutes or so and then, yay!!!! 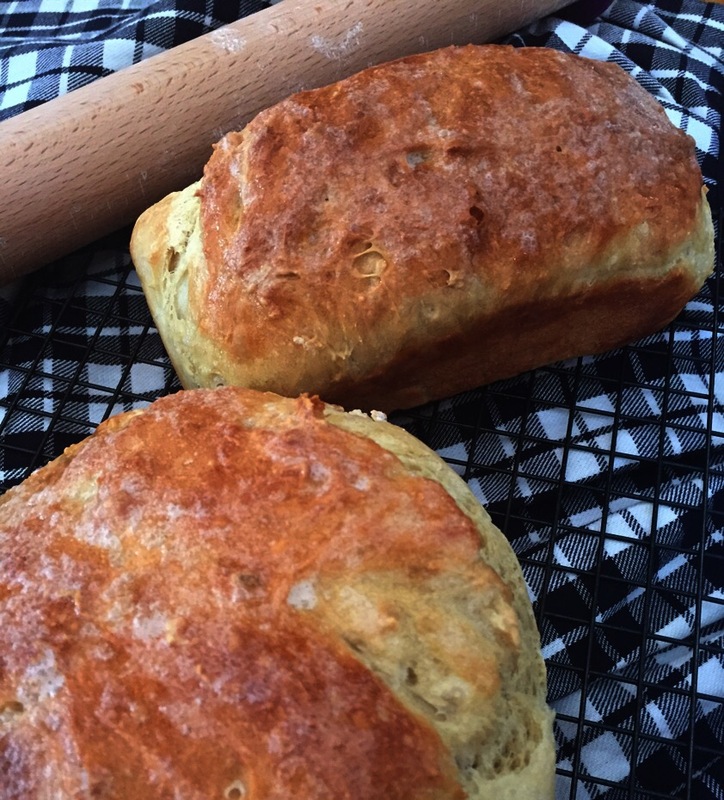 You just made two loaves of ridiculously good bread!